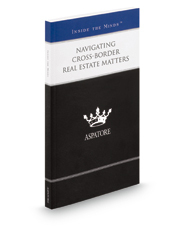 Navigating Cross-Border Real Estate Matters provides an authoritative, insider's perspective on the broad range of international real estate deals and the clients who initiate them – be it an individual, a private investment vehicle, a multinational company, a US-based fund sponsor, etc. Regardless of whether the transaction involves the purchase, sale, or lease of real estate assets in a foreign country – or in the United States by a foreign investor – this book describes the hyper-local nature of all real estate transactions and helps develop the reader's appreciation for the variation in countries' laws, cultures, and norms. These top lawyers describe the importance of understanding cross-border issues not only with respect to the country in which you are investing and the country from which you are investing, but quite often the intermediary countries through which an investment may be structured for tax, governance, and marketing reasons. Finally, these leaders reveal their strategies effectively structuring these cross-border deals with respect to tax implications for both domestic and foreign investors. The different niches represented and the breadth of perspectives presented enable readers to get inside some of the great legal minds of today, as these experienced lawyers offer up their thoughts on the keys to success within this high-stakes field.